Gordy is having a bad week. Superstorm Sandy has driven him out of his apartment and into a dizzying blur of other people’s couches, bad takeout, alcohol binges, boredom, stories of horrible destruction in the Rockaways, and aimless wandering between Manhattan and Brooklyn which all lands him, delirious and sleep-deprived, on the doorstep of his estranged ex-girlfriend, Mere. Over the next three days, Gordy will see the true extent of the storm’s devastation as his declining mental state steers him into a head-on collision with his own fear and anxiety. PAUL PIEKARZ (Projection Designer) is an up-and-coming video designer. Recent work includes Loneliness of the Long Distance Runner (Atlantic Theater Company), Facing Our Truth (National Black Theater), The Irresistible (Immersive Gallery), Old Paper Houses (Piehole), Asymptote to Zero Gravity and Perchance to Dream (Mich-Mash Productions). JACOB GRIGOLIA-ROSENBAUM (Fight Choreographer) has worked with Sherri Barber previously on Mr. Landing Takes a Fall and Tapefaces: Legend of a Kung-Fu Master. Broadway: Peter and the Starcatcher, Bloody Bloody Andrew Jackson, Cyrano de Bergerac, On the Twentieth Century. Other credits include: Peter Pan Live (NBC/Universal), Here Lies Love (Public), Sailor Man (also co-creator, New York International Fringe Festival, winner of Best Play) and The Buccaneer (also playwright, The Tank, Fight Fest), Dark Was the Night (Caliber/Image). When not making art out of violence, he can be found living in Brooklyn with his wife and sons. JOSEPH PINDELSKI (Dramaturg) is a Chicago-based dramaturg and is very pleased to work with Sherri and everyone involved with Gordy Crashes. Chicago credits: Venus in Fur, Other Desert Cities (Goodman), The Sweeter Option, Neighborhood 3: Requisition of Doom (Strawdog), The Drowning Girls (Signal Ensemble), and The Glass Menagerie (Steppenwolf – Next Up 2012). He has worked with American Repertory Theater, NYU-Tisch School for the Arts, Inverse Theatre Company, and Harvard University. Joe earned his MFA in dramaturgy and theater studies from American Repertory Theater/Moscow Art Theatre School Institute for Advanced Theater Training at Harvard University and BA from Catholic University of America. GAGE STEENHAGEN (Technical Director, Assistant Director) grew up in Iowa and recently moved to New York City to become a starving artist. He has previously interned at Second Stage Theatre, worked on productions throughout New York, and assisted Sherri on two productions of Latrell Live Tonight! at Joe’s Pub. Gage is a member of Ricochet Collective. CAROLINA ARBOLEDA (Assistant Stage Manager) received her BA in Arts and Sciences from Hunter College. She is the recipient of the Robert LoBianco Award for Stage Management and the Friars Foundation Scholarship. Most recently she worked as Production Stage Manager on Marla and her Prayers (New Perspective Theatre), The Pillowman (FITR Productions), City Non-Specific (La Micro Theater, FringeNYC), KEEPINGABREAST (Manhattan Theatre Mission, FringeNYC) and Bending All The Rules (Midtown International Theatre Festival.). 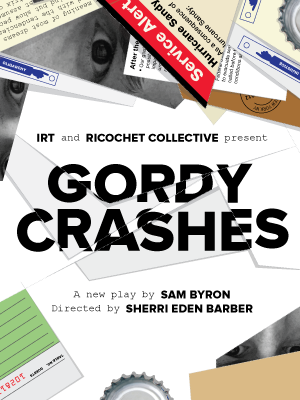 She is delighted to be collaborating with Ricochet Collective’s production of Gordy Crashes. CHRISTINE MCKENNA (Casting Director) is a freelance casting director based in New York City. Current projects: “Under Her Skin” (Nine Lives Productions/Triboro) and a number of independent theater, web-series and film projects. Christine established CMcKenna Casting in 2011 to be part of creating the type of intelligent, character driven, well acted, passionate independent projects that make films and television worth watching. Christine studied at the American Academy of Dramatic Arts.